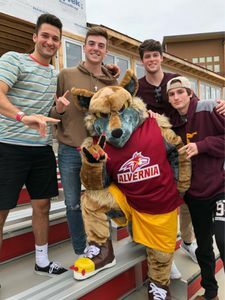 Choosing to embrace their Franciscan pacificst legacy, where the Roman Catholic saint of Assisi left the Crusades to become a monk, Alvernia lowered their Crusader nickname sword and shield for the last time and raised up the Golden Wolf of Gubbio as their new spirit leader. Keystone Mascots added a lot of thought into the design. His face holds a determined pose. The creation of a lightweight, easy to wear and wash muscular body with mesh inserts. He has five shaggy teardrop spots on his body - a nod to both the drops on Alvernia University's Coat of Arms and hearkening back to the St. Francis stigmata story. Hie eyebrows and muzzle also create the Franciscan Tau T, the cross by which St. Francis preached the gospel to those who heard him. Keystone Mascots enjoyed providing the performances of the first glimpses of the Wolf mascot at their Homecoming festivities and Basketball Preview Night. Creativity runs rampant when you run with the Alvernia Golden Wolf Pack!